The womb is the battleground in Texas these days, in a fight for healthcare rights that centers around the closing of 37 of the state's 42 Planned Parenthood-sponsored medical facilities. Governor Rick Perry wants to shut them down, saying doing so would increase the standard of care for women and eliminate frivolous abortions performed in "unsafe" environments. Opposing that view are millions of Texas women, led by Senator Wendy Davis (D-Fort Worth), who says the proposed abortion regulations are too restrictive and closing the medical facilities will impose difficult conditions on women across the state who turn to them for a wide array of medical services. Included in this list of services is healthcare for all phases of pregnancy- from fertility testing and family planning services to delivery and newborn care, cancer screening, and other medical concerns faced by millions of women in the state's rural areas. The bill to close the clinics and impose stricter rules for abortion, known originally as SB5, did not pass in the regular legislative session earlier this year so Gov. Perry called for a special session in June, with the bill last on the list. A vote had to be cast before midnight, June 25, to be voted into law. Wendy Davis braved an 11-hour filibuster to block the vote, no easy mission considering Texas law says a filibuster must be continuous and on-topic at all times. That leaves no legal opportunity for food and drink, sitting down, or bathroom breaks. Wendy stood tall, backed by an audience of thousands who filled the Texas capitol rotunda to capacity, shouting support and chanting enthusiastically as the night grew long and her opposing legislators became anxious to vote. Lieutenant Governor David Dewhurst declared Davis' supporters an "unruly mob" and called for the arrest of a 72-year-old Davis supporter; they also threatened to arrest to a group of demonstrators communicating in sign language. In spite of it all, Davis continued to stand and speak until minutes after the voting deadline. Within hours, Gov. Perry called for yet another special session to begin July 1. That special session started with protests on the capitol steps attended by thousands from Texas and beyond. Within half an hour of formal proceedings, a recess was called and debate will begin anew on July 9. 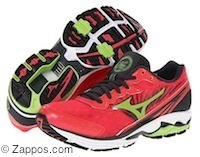 The rosy-red running shoes Davis wore during her history-making filibuster - the Mizuno Women's Wave Rider 16 - have since become phenomenally hot items on Amazon.